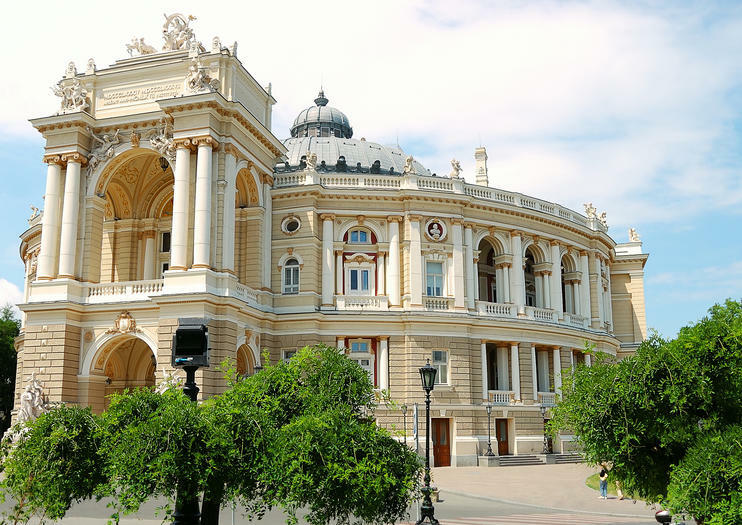 The Odessa Opera and Ballet Theater is the oldest theater in Odessa, originally opened in 1810. The original building was destroyed by fire in 1873 and was rebuilt in 1887 with elements of neo-Renaissance, Baroque, rococo and classical baroque elements. Niches on the top floor of the façade display busts of Mikhail Glinka, Nikolai Gogol, Alexander Griboyedov and Alexander Pushkin. The main entrance is decorated with stucco molding depicting dramatic and comedic episodes. The theater’s large, horseshoe-shaped hall is decorated with gilded stucco figures and designs and features unique acoustics that allow even a whispered voice to reach any part of the hall. In its early days, to keep theater patrons comfortable during the summer months, workers would lower ice and straw to the basement below the hall, from where cool air would then rise up through vents beneath the seats. Although it was renovated in 2007, the theater sits upon precarious ground and is in danger of eventually collapsing. The theater is located in the center of Odessa, just steps from the famous Potemkin Stairs. Theater-goers are expected to dress up; shorts, t-shirts, and “clothes for sport and beach” are not permitted. Children under the age of seven are not allowed at evening performances. Tickets may be purchased at the box office, but note that for current performances, tickets are available only one hour beforehand. Hours: The box office is open Tuesday to Sunday 11 a.m. to 7:30 p.m., with a break between 3 and 3:30 p.m. Evening performances typically begin at 6:30 p.m. and matinees typically begin at noon. Discover the highlights and hidden corners of Odessa on a private 3-hour tour. Spare yourself the stress of navigating crowded public transit, and relax in convenient hotel pickup and drop-off. You set the pace of the tour and are free to engage with your guide, every step of the way. Follow your guide to the city’s architectural and historical gems, including the Opera and Ballet Theater and Rishelievska Street. See the sights of Odessa on a private tour that provides an introduction to the city's major attractions. Check out the district of Arcadia, known for its beaches and restaurants; drive along French Boulevard; admire a view of the Black Sea coastline; and see Odessa’s main landmarks in the city center. With a private guide, you'll enjoy personalized attention as you learn about life in the city, its history and prominent figures. Odessa is the maritime center of Ukraine, located on the Black sea coast. Discover the highlights of the coastal city on this 2.5-hour walking tour, including architectural wonders like the 19th-century Opera House and Vorontsov Palace, the grand Potemkin Steps, and the unique Monument to the 12th Chair. Experience Odessa like a local on this private full-day tour and maximize your time with a custom-made itinerary. Admire the grand monuments along Deribasovskaya Street; visit the Potemkin Steps, Vorontsov Palace, and Odessa Opera and Ballet Theater; and enjoy a typical Ukrainian lunch at a local restaurant. This is the “must do” Odessa walking tour, miss it and you’ve missed Odessa. For Odessa Through the Centuries group walk takes you through 200 years of the city’s history. Worried that you will spend 2hrs listening to a monotonous lecture packed with known facts and stats? Not at all! Each sight in Odessa is an exciting mix of stories hidden behind an architectural facade. To hear the stories is to experience the city. We’ll explore the secrets and splendors of Odessa’s main attractions. We’ll sneak a peek behind the facades of the historic landmarks. We’ll take you through the old neighborhood of the city center. Its concealed streets and courtyards are keyholes into Odessa’s past. They harbor everything. From traces of the city legends to a forgotten well, the only source of so precious back then drinking water in that area. It’s old, vintage Odessa, full of character and off the beaten track passageways. They take you into the time of Odessa’s golden age. Join us! This group walk provides an exciting journey into Odessa’s early days. You’ll walk in the footsteps of Odessa’s early settlers, including Italians, Greeks, French and Jews. They arrived in the frontier of the Russian Empire and made the «Odessa project» happen. This walk takes you through the neighborhoods of the city center, soaked in history and packed full of the most entertaining stories. After all, it can’t be any other way! Odessa’s foreign settlers were adventurous and entrepreneurial people.We’ll walk through Odessa’s Palais Royal and through one of the finest and longest streets once called Italian. We’ll see the first English men’s club. Totally off the beaten track Greek street and La Strata Ribas – that part of it, which starts with the statue to Odessa’s founder in his actual size (I bet you’ll be surprised to see how he looked…). You’ll enjoy this walk. It will make you forget that you are somewhere there…..in Eastern Europe….. traveling…. You’ll feel at home!